After spending much of the day at NY Now, it was clear that brass and gold finishes are a continuing theme for interiors. 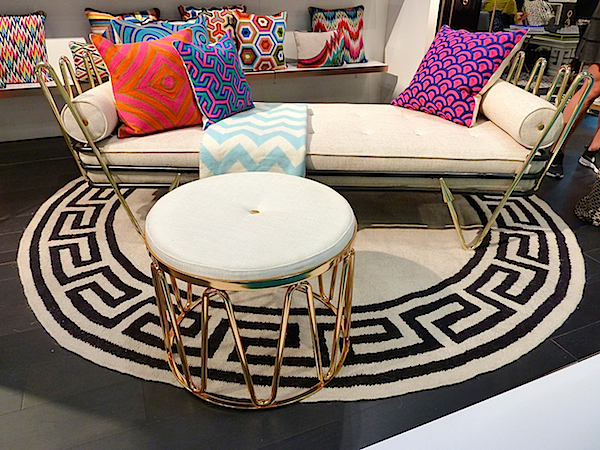 Nowhere was this more evident that at the upbeat booth of Jonathan Adler, where tons of fun introductions included bright brass details. These dome topped Globo Boxes are great gifts that would add a pop of glamorous fun anywhere from desktop to bedside or vanity. And while not within the theme, I couldn’t ignore the giant lucite purple foot (over two feet long and a foot high) – an entertaining conversation starter whether used for drinks table or art. 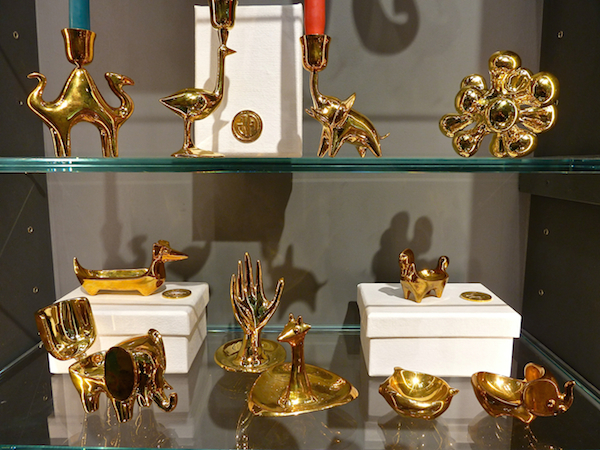 An entire menagerie of brass accessories include candlesticks, paperweights, ring holders, small dishes and objets. Their whimsical chic make them perfect picks for holiday hostess gifts. 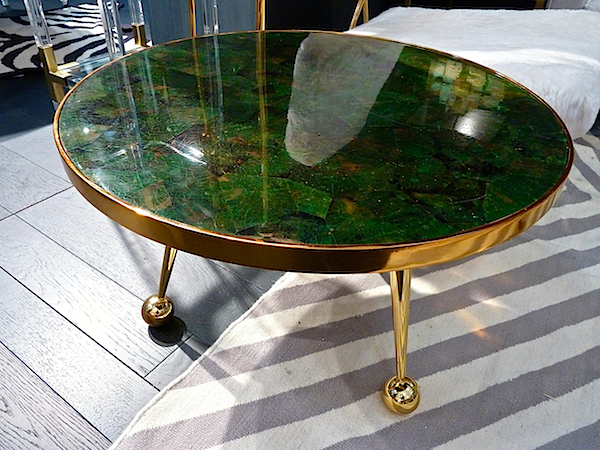 The Caracas cocktail table seems to walk the line between 60s Sputnik chic and organic glamour. With a glossy penshell top, the green recalls the richness of malachite with a new textural spin. This is a great little table that adds a big dose of eclectic style. It is hard to find a piece the size of the new Turner credenza. A modern piece with a vintage vibe, it is bold and graphic yet versatile. 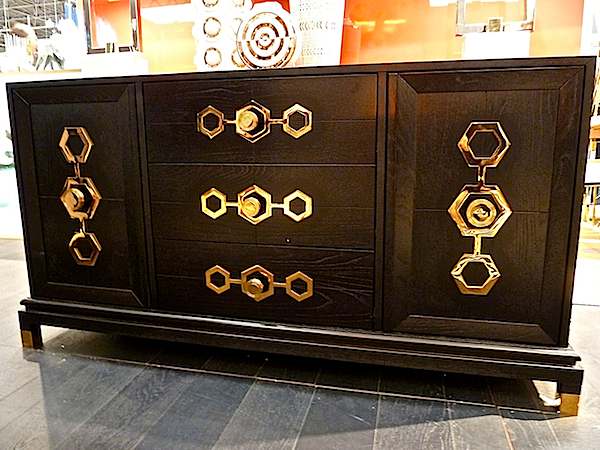 The popular hex theme of the custom hardware is reminiscent of the honeycomb pattern seen in other Adler collections, yet feels somehow chinoiserie inspired here. Offering great storage with sassy style, this would be perfect for kitchen, dining or even bedroom. For an added dose of polished poise, consider the Crawford Cabinet. 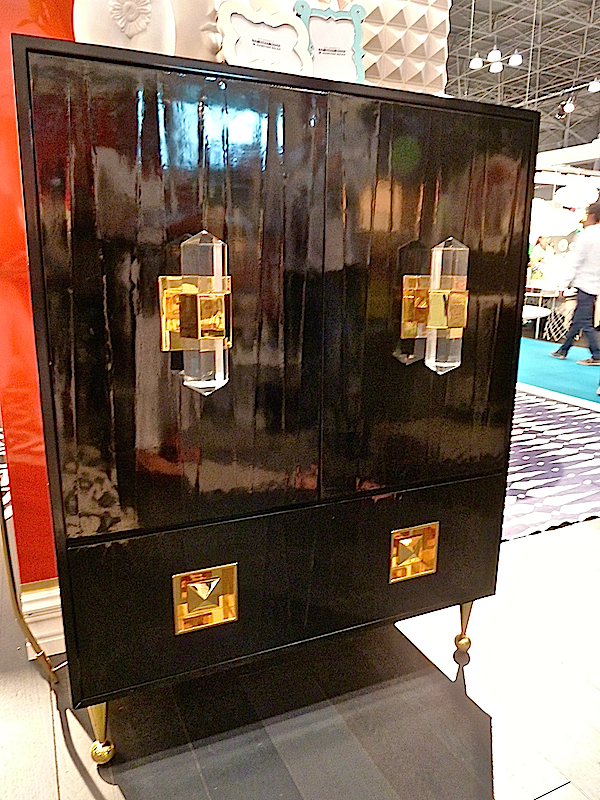 With dramatic lucite and brass hardware, a specialty textured lacquer finish and a feminine perch on those balled brass legs, it speaks Hollywood glamour like its namesake star. Again, at 52″ high, a piece that would be comfortable in almost any room in the house. The daybed seems to be making a comeback and this new sculptural brass version references classical style in a whimsical way. The companion stool is a light and glossy go anywhere piece that adds a hint of shine without much visual space. The mania for Greek key continues and the occasional rug is the perfect foil for a round dining or entry table. One of my favorite new pieces is the latest addition to the Jacques collection. 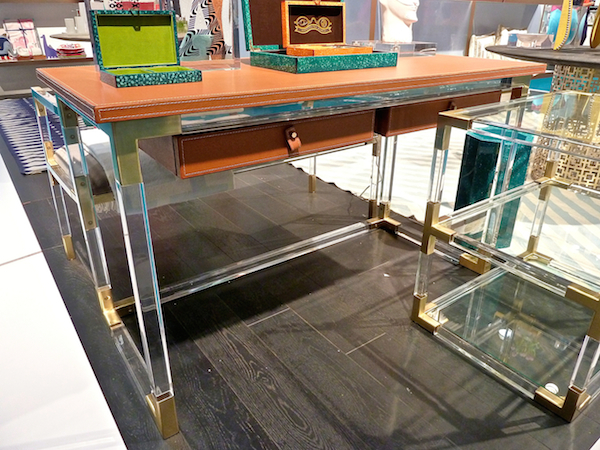 In what seems an obvious homage to the French modernist master, Jacques Adnet, the desk features topstitched leather detailing with the contemporary addition of lucite and the collection’s signature brass corners. Fabulous flair for any office! The Future pottery collection is contemporary glamour melded with neoclassic allusions. 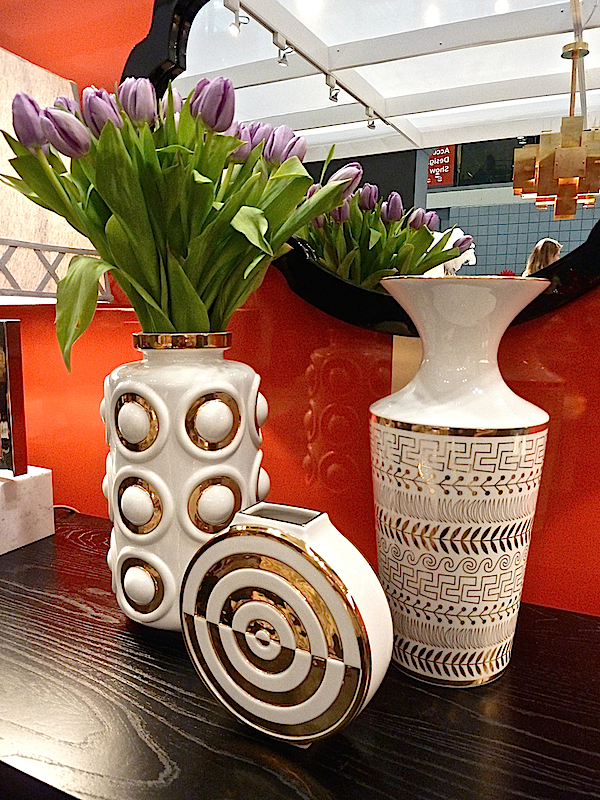 Perfect accessories for any style room, they straddle old and new with graphic appeal. The Venom coasters are the newest addition to the porcelain coaster series. The gold enhanced pattern recalls both Cleopatra and Fornasetti in its reptilian chic. Great for everything from wine glasses to condiments to jewelry, they are hissing with giftable style. The black and gold malachite patterned glasses in the back are also new and I think would be so stylish for the holiday season. Stop back for more from NY Now. This entry posted in design, furniture, gifts, interior design. Entry Tags: Designer furniture, Hostess Gifts, interior design, Jonathan Adler, NY Now Bookmark the permalink. 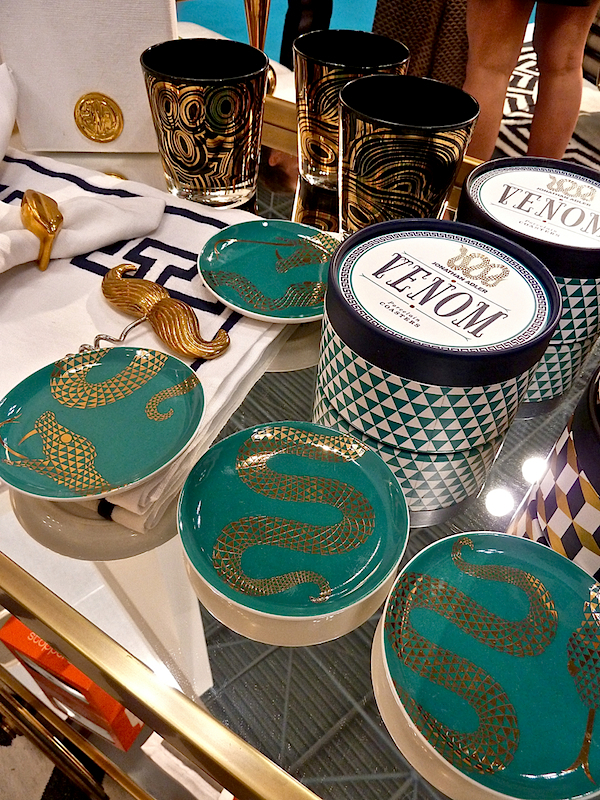 I’m also a big fan of all the brass and gold, and Jonathan Adler Design of course. I want that little green table and that beautiful Crawford cabinet. 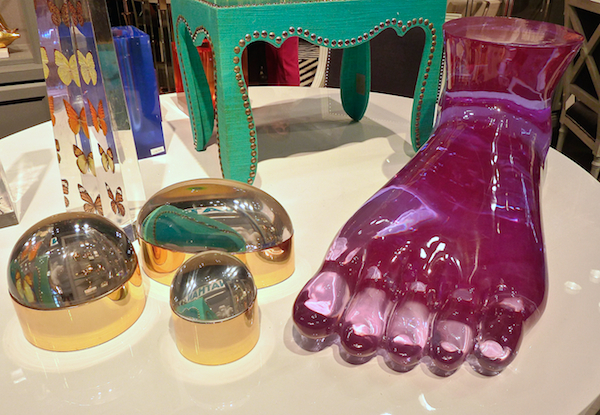 The Globo boxes are pretty great, but that foot…who doesn’t need a fabulous purple foot…I do. Fun post. Two of my co-workers are heading to the gift show today! Can’t wait for them to read your posts. Thank you for the wonderful sneak preview! 78 queries in 0.478 seconds.